Brain Breaks Action Songs: Let's Move! Here at Teacher Boutique, we have the best selection of music for kids. Our music for entertaining kids includes CDs from the most popular children’s musicians around! This is educational music for the classroom and the home designed to get kids moving and thinking. From learning about all the wild animals of the world to learning their numbers and letters, we have something for everyone. Our music for kids will instill valuable life lessons including songs that teach kids how to grow up strong, confident, and safe. 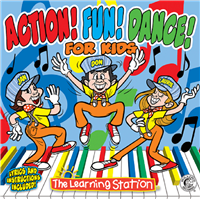 Our music for entertaining kids includes all the top children’s entertainers including Jack Hartmann and The Learning Station. All young kids will love the gift of music when you play these fun and creative CDs. Shop around to enjoy our wide selection with low prices and fast, free shipping on select items or give us a call at 1-800-23-CHILD to speak with our team of experts waiting to help you find everything you need before you buy.